Channel 4's World's Maddest Job Interview and Learner Adams Bones are two of our most recent clients at toast, among a few other corporate requests. First up, Bob Hough, our head of graphics, put together the opening title sequence for the World's Maddest Job Interview, which was first aired on Channel 4 on Wednesday 25th July 2012. The programme has stirred a debate about how mental health issues are touched on by the media. But, having watched it ourselves we think that the topics were covered sensitively and did well to break up conventional stereotypes of how mental health affects performance in the work place. 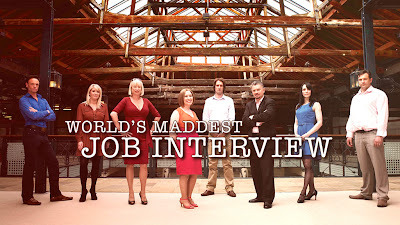 Bob Hough provided the graphics for the opening title sequence of C4's World's Maddest Job Interview. Then, today (Monday 30th July 2012) we went on a green screen shoot at 01ZERO-ONE for Learner Adams Bones, which went much faster than predicted! John adjusts some lighting for the Learner Adams Bones shoot. Otherwise, our Go Viral competition was featured on the BBC Writer's Room last week, alongside Televisual's website! Please do keep spreading the word - we'd love to get as many young creatives involved as possible. If you have any questions, don't hesitate to email us or post a comment. Watch out here for further hints and tips. Email Vicky on vicky@toasttv.co.uk or call 0207 437 0506 for interview requests, quotes and further competition enquiries. Sign up to our newsletter, or follow our Facebook page and Twitter for competition updates. I saw many people on internet that they purchase thing after watching the video of the same product. It means that video is the best way to increase the interest of the viewers.